DISCOVER THE ENDS OF THE WORLD! Science Writers in New York (SWINY) invites you to a timely book talk at Books Are Magic, Brooklyn’s newest independent bookstore in the heart of Cobble Hill. 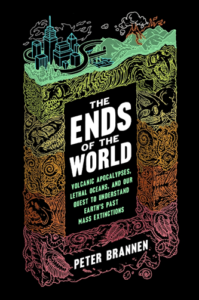 As new groundbreaking research suggests that climate change played a major role in the most extreme catastrophes in the planet’s history, author Peter Brannen takes us on a wild ride through the planet’s five mass extinctions and, in the process, offers us a glimpse of our increasingly dangerous future. Award-winning journalist and author Peter Brannen will be in conversation with David Biello, Energy and Environment Editor, Scientific American. Book signing to follow.